Oh, look! 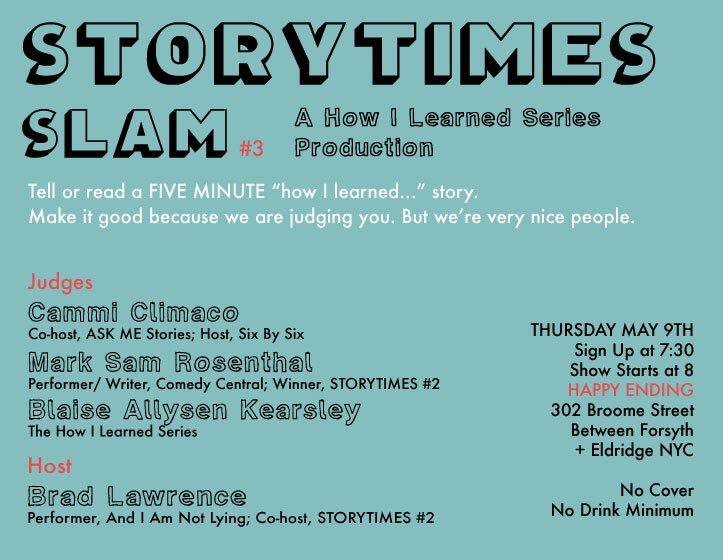 It's the third biannual super special How I Learned STORYTIMES Slam. 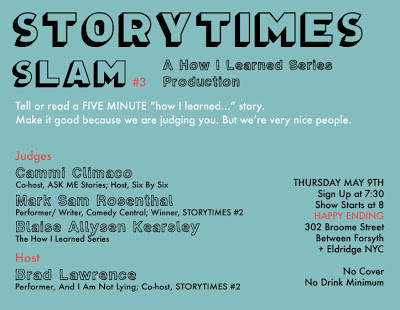 Tell or read a FIVE MINUTE "how I learned ______" story in front of an audience and 3 judges. No scores. Just wise and friendly feedback based on story, delivery, length of time, and probably something else that Brad Lawrence has in his head that the rest of us don't know about. One "Best in Show," picked by the judges, will win a prize. Not sure what. Maybe a bag of chocolates from Duane Reade, like last time. MAYBE THIS TIME IT WILL BE FROM RITE-AID. Also, you don't have to share a story at all. You can just come for the drinks and the entertainment and maybe someone will share with you their hard earned chocolates or whatever. Either way: FUN.